Marvel Two-in-One #21: Blacksun Lives! This issue has a great start: two stories, told in parallel panels side by side down the page. On the left, we find Ben and Johnny in the present (1976) at home in the Baxter Building, where a woman has come to them for aid. On the right, we find Doc Savage in the past (1946) at home in his Empire State Building headquarters where a mysterious woman has come to him for aid. Both women faint, and we learn that Ben's visitor is Janice Lightner, while Doc's is Lucinda Lightner. Both relay their stories: in the present, Janice is the twin sister of Thomas Lightner, a brooding engineer. In the past, Lucinda is the husband of Raymond Lightner, a disturbed Nobel Prize winning astronomer (and, by the by, Lucinda is pregnant). In the present, Thomas is obsessed with his father's theroies, and has rebuilt the 'sky cannon' that killed his father. In the past, Raymond has just built his 'sky cannon'. In both the past and the present, they're planning on testing it that night, and simultaneously in both times a blackout occurs, making everything pitch black except for a flicker from up the Hudson where the Lightner mansion is. With both stories still continuing side by side, Ben, Johnny, and Janice get into the Fantasticar and head north, while in the past Doc, Monk, and Renny all pile into the Autogyro and head north. As each approaches the mansion, each is hit by a blast from the sky cannon, and suddenly both stories merge into one as all six people find themselves falling to the ground together. 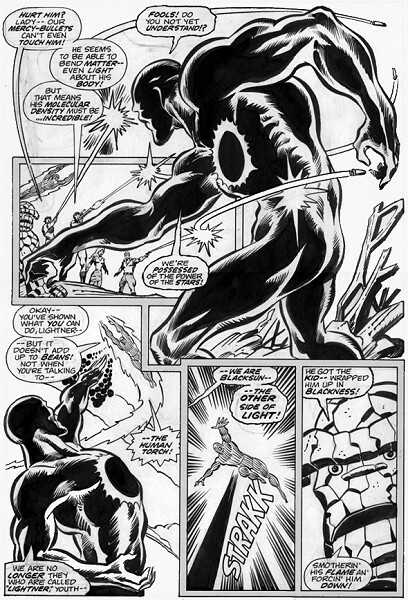 The beam, deflected back to earth, strikes the father and son in each time period, merging them into one being... Blacksun! As a mildly confused Ben steps up to take on Blacksun: "...but it can wait until I polish off this here super-villain of the month! An since ya say there's two of ya in there-- It's Double or Nuthin'! Better known as Clobberin' Time!" This is the first appearance of Thomas Lightner, as one-half of Blacksun. He goes on to a featured part in the Project Pegasus saga (issue 53-58) as the Nth Man, and then many years later plays an very major role in the Squadron Supreme: Death of a Universe graphic novel. He's now become the Sorceror Supreme of the Squadron Supreme universe! Original art from your editor's small collection. 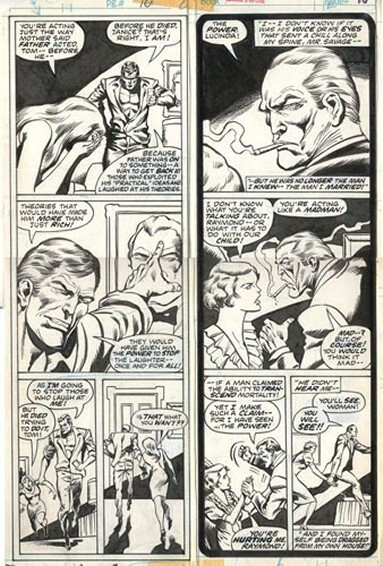 The page at left may not be the most amazing page, but it does nicely show the side-by-side storylines from different time periods, and hey, thats a pre-superpowered Thomas Lightner on the left, one of my favorite MTIO villains, so what the heck! The headshot in the second panel, left column, was reprinted in the Mysterium Official Handbook entry. The page at right came much later, and nicely has both Doc and Ben on the page! I love the effect of the bullets warping around Blacksun. Released in early November of 2005 was Essential Marvel Two-in-One volume 1, which effectively covered MTIO #1-25. However, this wonderful issue was sadly not included. This was because of licensing rights (Marvel no longer holds the rights to Doc Savage)- Marvel did indeed try to acquire the rights for the one-time publication of this Essential, but things fell through.